Dogs really love getting dirty. They enjoy taking walks, rolling around in the grass, playing in the park, and even smelling things on the ground. This makes them happy, but, the end result is a smelly dog, that may even have picked up something harmful along the way. It is true that you shouldn’t clean your dog too often because it may strip out important oils which take care of the dog’s coat and skin, most especially the Labradors. However, bathing them once in a while with good quality shampoos can make your life much easier. When it comes to the best shampoo for itchy skin, it should first be able to deodorize your dog without necessarily irritating his sensitive skin. Secondly, it should have natural oils for preserving the coat and the skin in good condition, plus, it should avoid allergic reactions and the need for stronger products. See the short version here pulled together is a handy comparison table for you, look through the detailed reviews of each one – or jump to the end to read our Guide to Buying Dog Shampoo! Deep cleansing of your dog’s fur. Condition the coat and leave it soft and shiny. Detangle the hair using a light foam and easy to use formula. Moisturize the skin in order to stop itchiness. Soothe the dog’s eyes and ears with its no-tear ingredients. Eliminate unwanted bacterial and any bad odors, leaving your dog smelling fresh and great. Wet the coat of the dog thoroughly. Apply a very generous amount of The Healthy Dog Co. All-Natural shampoo all over the dog’s coat. Massage your dog with the shampoo gently, and ensure to cover each and every base. Rinse the dog thoroughly till the water running through is clear. The shampoo is made of natural ingredients such as; Coconut oil, fresh Lemongrass, Rosemary, Tea Tree, Oatmeal, Jojoba oil, Aloe Vera and Biotin. It is non-toxic and organic, which makes it ideal for all dogs, even those that are extra sensitive. It has a tear-free formula that ensures safety for the dog’s eyes and ears. It will also leave your dog feeling and smelling fresh after the bath. Safe as it is made from natural ingredients. Does not irritate the eyes and ears. Eliminates bad bacteria and odors. Leaves the dog smelling and feeling fresh. It is 4 in one formula does more than clean your dog. It is runny, so you may end up using more than anticipated. 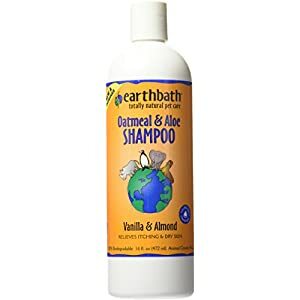 This is a oatmeal-based dog shampoo that leaves your dog’s coat clean and healthy. You will need to wet the dog’s coat first, then lather it thoroughly ensuring your cover all the bases, then rinse it completely and ensure to have clean and clear water in the end. Your dog will not only feel fresh but also smell great and have a silky smooth coat. It is made with lavender and mint and calendula for soothing itchy and sensitive dog skin. There are also lavender and peppermint essential oils with antiseptic and anti-inflammatory properties to give your dog’s coat a lovely and fresh aroma. The product is non toxic and all natural with specially choose ingredients which conditions and strengthens the dog’s coat. This shampoo will improve the feel and health of the dog’s coat, and leave him looking smooth and shiny. Made of non-toxic natural ingredients. Helps in soothing a dog’s itchy and sensitive skin. Ideal for keeping your dog’s coat healthy. 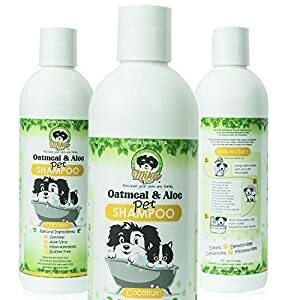 Having 100% oatmeal and Aloe Vera extracts as the main ingredients, this shampoo is enough to convince any dog owner that this is one that should leave your dog clean, smelling fresh and should also soothe sensitive skin. The Oatmeal and Aloe extracts come highly recommended by veterinarians for dogs that have sensitive and itchy skin. These ingredients combat this skin irritation and will leave your dog healed, plus they re-moisturize dry, sensitive skin. It is completely natural, pH balanced and soap free. After use, your pet’s skin will be left clean, deodorized, with a delicious vanilla and oatmeal fragrance, plus, his skin will be soft, plush and shiny. The shampoo boasts many other ingredients such as wheat protein, humectants, and rosemary leaf extract which almost sounds like a healthy snack. It also has no alcohol or parabens present in its make-up. Should help soothe the dog’s body. Gets rid of bad odors. The sweet smell doesn’t last too long. Does not wash off fleas. This is a great shampoo for dogs that have very sensitive skin and those that have a foul smell. The GROOM PROFESSIONAL baby fresh shampoo will soothe your dog’s skin, and leave him smelling fresh and clean. It comes in a 250 ml bottle, that you will need to dilute at a ratio of 20:1. It also has an applicator lead for easier mixing and ease of use as well. It is an excellent cleaning shampoo that is suitable for all dog types and coats. Made up of Aloe Vera, it will cleanse the skin of your dog, and the talc fragrance is amazing. You need not worry about your dog anymore. 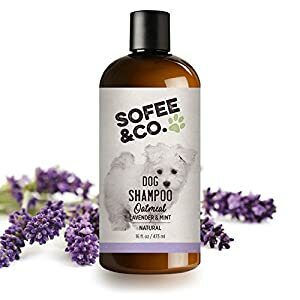 With the excellent customer reviews, this is truly a great shampoo for your sensitive dog. Does not irritate the skin of your dog. Ideal for very smelly dogs. Aloe Vera is a powerful soothing ingredient. This comes highly recommended by vet dermatologists and groomers. It is a dog shampoo that is designed for sensitive skin, itchy skin, and dogs that have a foul smell. It is specially formulated with medical grade ingredients that work together for your dog’s skin, and they lift and remove any unwanted impurities, and provides adequate air flow and open pores. This is critical if you want your pet to release the cause of unwanted skin irritants and other germs that cause the terrible yeasty dog smell. It does not require a prescription for you to buy it. Most customers who bought this shampoo were overjoyed by the results, as it did exactly as advertised. It worked well on sensitive skin of both dogs and cats. It is also ideal for dogs that have dry skin. It is fast acting and immediately begins soothing your dog on contact and stops the mad scratching. Your dog will absolutely love it as it does not irritate and soothes if he has raw or wound covered skin. It will calm the dog and maintain him at an optimal condition. It will leave your dog with a healthy and balanced skin as well. The ingredients will nourish him and leave him soft, silky and shiny. The result is a very happy dog. Highly recommended by vet dermatologists and groomers. Leaves your dog with a good fragrance. Ensures your dog’s skin is rejuvenated. Calms your dog’s errant scratching. Makes your dog’s skin to be soft, shiny and silky. Not as effective as other shampoos. Does not lathe up very well. 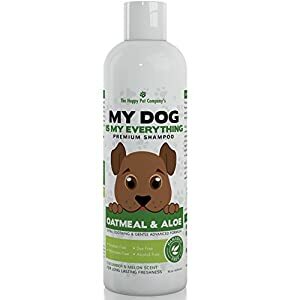 As the name suggests, this is a dog shampoo that is ideal for dogs that have itchy and sensitive skin and is made from high-quality natural ingredients that contain no chemicals that can harm your dog. It is made of Aloe Vera, Vanilla, Lavender, and Frankincense. It is made of puppy save essential oils, that are used by the top-rated dog groomers. The shampoo is Paraben free, pH balanced and ensures the very best coat for your sensitive and itchy dog. Rich in the non-toxic and non-irritant formula, you shall surely thank Cooper and Gracie company for this one. It helps in fast healing and repairing of any wounds on the dog’s skin, plus, it gently moisturizes and restored any damages to the coat, with its anti-bacterial and anti-fungal protection. Satisfaction is definitely guaranteed with this leading dog shampoo manufacturer. Ideal for the sensitive and itchy skin. Fast healing of wounds and other abrasions on the dog’s skin. Choosing the right shampoo for your dog is not a simple process, and a lot goes into this decision. Do not assume that what worked for your friend’s dog will necessarily work on yours. You must take time and make the right decision for your dog. The cost of the shampoo is important, but it may not matter as much if the shampoo you need has been prescribed to you by the vet. If you buy cheap products to save on cost, you may end up causing a worse reaction on your dog. 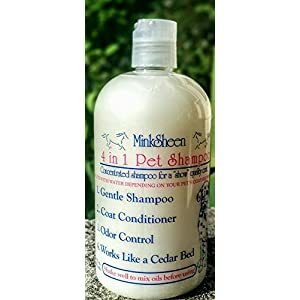 A good shampoo should be one that will eliminate the current problem that your dog is having, and the cost must never be a deciding factor since most of these shampoos are not too expensive to the point of becoming unaffordable. Some dogs are highly sensitive while others are not. This is definitely one of the most important points to consider when buying a shampoo for your dog. If you feel that your dog may react negatively to the shampoo you wish to buy, then consider a visit to the vet first. The best shampoos are those made from natural ingredients. This is because they are less likely to irritate the dog’s skin. If you buy products full of chemicals, you may end up with a bigger problem than you anticipated. Choose products that are cruelty-free, and paraben-free. These are guaranteed to offer the least amount of irritation if any, on your dog’s skin. You do not want a shampoo that will perform just one task. You want one that will clean, moisturize, detangle, sooth and treat any skin related problems. This not only helps with your dog but also saves you from having to buy other products that will perform the rest of those tasks. Choose wisely, and find a shampoo that can perform all of the required functions in one. They are there, as you have seen above, and in most cases, they are simply the best. Sometimes dogs have some abrasions or cuts on their skins that you may not be able to see due to the coating. There are shampoos – some we have discussed above, that have healing properties. Not only that, you will find some brands even have antibacterial and anti-fungal properties. It goes without saying that these are the best, as they will even eliminate problems you did not know existed in the first place. One thing that must be mentioned is; DO NOT use human shampoos on dogs. This is because the pH levels on dogs and humans are completely different, and if you think your everyday shampoo has great ingredients so why not use it on your dog, you will be making a huge mistake. Using your normal shampoo will create an imbalance in your dog’s skin and cause irritation that will lead to itching and constant scratching. Another important point to note is; DO NOT clean your dog every day. Find out from your vet the number of times you can clean your dog per week or per month.